the UK’s original recreational tree climbing company. Our two hour tree climbing experience is a unique and offbeat adventure perfect for ages 8 to 80. 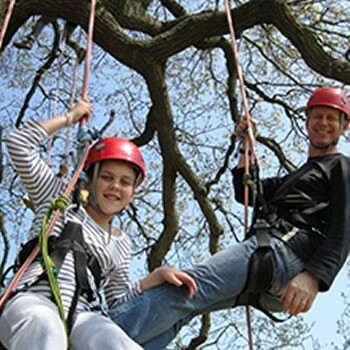 Join us; the magical thrill of tree climbing is brilliant tech free fun for the whole family. 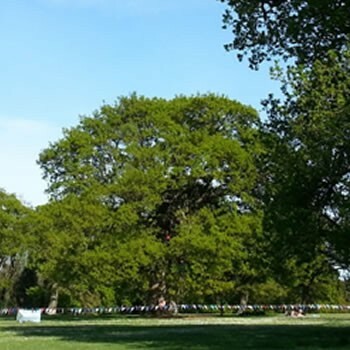 Come tree climbing with us and create memories in historic Appley Park, Ryde. Just a short 25 minute stroll from the ferry, hovercraft and bus station, our beautiful mature oak tree sits in the centre of a stunning park, with panoramic views over the Solent and beyond. Our friendly and experienced Goodleaf staff will show you the ropes so that you can safely scale the heights of the 70 foot oak tree. Once you’re in the canopy, relax on a branch or in a special tree top hammock or challenge yourself to climb as much as you want to. When you’re back on the ground, relax on the picnic blanket, enjoy a cup of tea and a piece of home made Tree Climber’s Flapjack. If that’s not enough to tide you over, bring a picnic to enjoy in the green surroundings of the park or eat out at one of the local foodie destinations nearby. We’ve had a wonderful time guiding thousands of people into the canopy since 2005 – we look forward to welcoming you to the Goodleaf experience! Here’s how to book. As seen in The Guardian, Vogue, The Telegraph and on the BBC.